Are you going away for Thanksgiving? If you are driving, don't forget to pack your coupons! Different parts of the country have different stores with different coupon policies and different sales. Spend some time googling the area you are driving to (or through) and research the stores there. Last time I traveled I got a great deal on laundry detergent by finding a store that would double $1 coupons. Awesome! When couponing for great deals sometimes you have to think outside the box. For example, where would you normally purchase bottled water and toilet paper? Probably the grocery store, Target, Walmart or even Costco. Where did I get mine? Office Depot and Staples. Unusual, I know, but I got an awesome deal! Of course these products typically cost more at office supply stores, right? Well here's how I got the deals - a combination of a sale at Office Depot, and a great coupon for 75% off any item at Staples. Office Depot is one of the stores that accepts competitors coupons so I walked in with my Staples coupons and combined them with the Office Depot sale prices and got a 24 pack of bottled water for 75 cents (3 cents each), and a 16 pack of toilet paper for $1.25 (8 cents each). The coupons are one per customer so the hubby tagged along and did the deals with me. I won't drive out of the way for deals, but during our Saturday errands we usually pass by any stores I may need. We hit 3 local office supply stores and we were set! A key component to couponing is learning to plan ahead. This is something I am learning to do because I don't do this naturally. I am one of those people who wakes up to the first snowstorm of the year and realizes the kids don't have snow boots that fit. Thankfully my husband is a planner, so rarely do our kids wind up with frostbite on their toes. I am getting better at planning ahead when it comes to couponing. I used to only buy what I needed exactly when I needed it. The stockpile concept requires you to plan ahead and get things you know you will need BEFORE you need them. Here's an example of some of my recent plan-ahead couponing: We bake a LOT of cookies at Christmas and go through a ton of ingredients. Last week I was able to get a great deal on white, brown and confectioner's sugar. Just today I got 8 packages of butter at a great price (expires April 2012). I am now on the lookout for flour, vanilla extract and a few other ingredients. My hope is to have most of what I need in place so I don't have to buy it at full price right before Christmas. Wish me luck! When I got home from work I checked a few couponing sites and saw a one-day-only coupon for 14 free color copies at Office Depot. As a teacher I have to pay to get color copies of my materials, so this was exciting! But honestly, I did NOT want to go out at 7:00pm. I quickly checked through my binder for some other coupon/sales matchups for this week to see if I could make it a bit more enticing for me to drag myself out of the house. I found several good ones and decided to head out. In the end I spent $9.34 for $81.44 of stuff - 89% off! Well worth the trip, I think! This morning I received my 4 subscriptions that are delivered to my house, but they only had one coupon insert in them. Since the number of coupon inserts varies week to week, I might have just assumed that was all that was coming today. But I regularly check Sunday Coupon Preview and knew 2 inserts should be in there. Regardless, my point is to know what inserts are coming so you can make sure you get them. If you are buying your papers at a store make sure you check the papers before you buy them. If you are having them delivered, make sure you check them early enough in the morning so you can report any problems if necessary. A few pretty decent coupon deals have come up lately that require 10 coupons. Since I only buy 4 copies of the newspaper, I generally don't have 10 of each coupon unless they are printable ones. So what can I do? There have been times when I have bought coupons from a coupon clipping service. Clipped coupons are available from 5 to 15 cents each. You can also get complete, uncut inserts for approximately 80 cents each. You can get them for less when you get multiple copies. I haven't gotten complete inserts from a service, because it's cheaper for me to just buy the newspaper instead of paying 80 cents for each of the 2-3 inserts that come each week. While I don't believe it's a reasonable option for every week, it is a good option if you somehow completely miss a week of coupons. A better option all around is hooking up with other couponers and exchanging coupons with each other for free. It's a win-win situation - you help others and help yourself! I came home from the food store today with 4 more free tubes of toothpaste and was met with the question, "You got MORE free toothpaste?" Yes, I will admit I have too many tubes of toothpaste. It's one of the few items where I have broken my rule of only stockpiling the amount that my family will use prior to them expiring. So why do I have so many? Yes, they were all free, but I also found out that our local food pantry accepts personal care items - and toothpaste and toothbrushes are on the list! Keep in mind that donating is a great way to share all the great deals you get with coupons! Despite living deep in P&G country, and being friends with several of the Proctoids that work there, I have been known to disparage P&G and their coupons on this blog. Rarely do you see ".25 cents off 3" coupons these days, but if you do you can be sure they are P&G ones. You can also be sure they say "limit 4" on them and that they expire within 1 month. Ugh. They are the reason I have a basement full of Brawny, Cottonelle and Kleenex instead of Bounty, Charmin and Puffs. The only thing that saves me from completely trashing them is the fact that they rotate and thrown in one good/great coupon each month. Last month it was the "$8 off 2 Covergirl products" I used a few days ago. This month it's "$2 off 1" Tide. Their Tide coupons are usually ".50 cents off 1." Now hopefully I can find a store coupon or store reward to pair it with for a great deal before it expires. When I started couponing I made some mistakes. I bought several tubes of toothpaste that I got for only 75 cents each before I found out that toothpaste is one of those items you can always get for free. Since then I've been a bit more wise, until just recently. I started stocking up for Halloween candy about a month ago when I found I could get bags of Hersheys and Mars candy for only $1. Well the coupons and deals are just pouring in right now and I got the same bags today for only 25 cents. Oh well, live and learn! Next time I'll know to wait to buy my candy, even though it might kill me! For the record, if you still need to buy candy, there is a great $1.50 off 1 coupon on coupons.com and a $1 off 2 coupon at Target.com. These are in addition to all the coupons that came out last Sunday. If you cannot find a magic deal at any one store, grab your ads from the other stores and head over to Walmart where they'll price match or accept competitor's coupons, in addition to the manufacturer ones. OK, it's not as weird as it sounds, but I did have a startling revelation in the shower this morning. I was truly shocked when I realized that EVERY product being used in the shower was completely free, or I made money by purchasing it. Shampoo ($4.99, free at CVS), conditioner ($3.79, money maker at CVS), body wash for men ($4.99, free at Target), body wash for women ($3.99, free at Target), and razor ($8.79, free at Target). All for free! Plus, I have between 4-8 more of each of them in the stockpile. This caused me to start looking around the bathroom. The toothbrushes, toothpaste, floss, hand lotion, shaving cream, razor blades, and deodorant were all free, too. I was suddenly very proud of my couponing efforts! Previously I'm mentioned in this blog that I am a bit embarrassed by my coupon binder. Shocking, I know. I'm sure many couponers carry their binders proudly, but not me. Don't get me wrong - I love my coupon binder for sure - but just the act of carrying it from my car into the store remains a stressful activity for me. Once in the store I feel it could almost pass off as a purchase siting in my cart, but when carrying it into the store, it's pretty noticeable (and has been noticed). Also, I won't bring my binder with me into the smaller drug stores. I just bring the stack of coupons I intend to use. Yes, occasionally this results in me having to leave and go back out to my car to get coupons that I had not planned to use, but usually my drug store lists are pretty tight. Today at the grocery store I ran into a friend I haven't seen in many months. I had my binder in the car, with my list on top of it. I found myself hoping she wouldn't notice it. Why? I'm not really sure. I haven't figured out this quirk yet. This weekend I heard from two friends about couponing. One visited recently and took an interest in my stockpile. He started collecting coupons the weekend he was out here, and has continued for the last few weeks. I'm excited because he "gets" the concepts of needing multiple coupons and needing many weeks of coupons to get off and running. YAY! He also contacted me about doing a coupon exchange. He is definitely on his way to success. The other friend, who has couponed for a while, recently saw my coupon binder and was hooked! She has spent the last few weeks making her own and just let me know that she saved $58 at the grocery store. She credits her success to the easy access to the coupons in her binder. Another success! My favorite coupon deal site, The Krazy Coupon Lady, tracks coupon/sales matchups for several of the major national chains - Target, KMart, and Walmart, as well as some other large chains - CVS, Walgreens, and RiteAid. It also covers some small grocery stores that may or not may be local to your area. One of my local grocery stores is included, and one is not. I have recommended this site to several friends in the northeast, and none of the local stores there are included either. Even if your local stores are not included, this site is still worth it for the national chains - and frankly those stores are where I do the bulk of my couponing. But what about your local stores? You'll need to start doing some research to find some good sites. So you've got all the coupons. Now how do you find the great deals? These days I still look through the circulars, but I find the majority of the coupon deals online. There are countless websites out there where hardworking couponers have spent hours and hours tracking down the best deals. I am forever indebted to these couponers and would be up the proverbial creek without their efforts. Next we'll cover some great sites, and how to find more of them. Last night the family and I were watching the latest Extreme Couponing. As much as I love the show, I do get frustrated with it (sometimes I yell) and this one was no exception. Here's the scenario: the gal was shopping at Kroger, which is a store that I often shop at as well so I know their coupon policy. As she was going through the aisles she was saying how this item was going to be only 50 cents, that item would be only $2, etc. She then ended up getting her groceries down to just a few dollars. Now, I happen to know that Kroger does NOT allow for overage, so how'd she do it? Well, a freeze-frame of her checkout screen (YAY Tivo) revealed a $150 discount for transferring prescriptions. That means she transferred 6 prescriptions over. Now, I don't begrudge her using that discount. It's a great way to get your bill down, but it's not something you can keep getting and using indefinitely. Regardless, I feel this is misleading and gives the wrong impression to viewers that all their savings are due to coupons alone. Extreme Couponing should have pointed out this idea for additional savings so everyone could benefit from it. Despite new, more limited coupon policies, most stores will allow you to do multiple transactions. This basically means you check out with some of your items and pay. Then you do the same with the rest. If I find a really great deal, I have been known to do a 2nd transaction on some occasions - usually only if the deal or my coupons are about to expire. I still usually bring my husband with me for the 2 transaction trips. Not because I need to, but because it just makes me feel justified about it since technically one transaction is mine and one is his. Honestly I'm still somewhat embarrassed by doing multiple transactions. That being said, doing two transactions results in using double the amount of allowed coupons, just split over 2 transactions. Like I said, some stores allow it. Some don't. I was watching Extreme Couponing the other day and the woman did 42 separate transactions. Good grief! The question is, if the store limits coupons per transaction, why do they then allow multiple transactions? Maybe that will be the next restriction. Organization is crucial with regard to all aspects of couponing, including organizing your stockpile. Not only do I have different stockpiles for different purposes, I also have discrete areas within my main stockpile. For example, I have one section for all the food products, another section for all hair care products, one for soaps and body washes, etc. One thing I'm not picky about is soap and body wash. I find they all get dirt off of your body. So I have MANY different kinds in my stockpile. However, I group them all together so I have a true picture of what I have in terms of body wash. It would make no sense for them to be spread out in different areas. My stockpile is organized by category. Right now my stockpile is still fairly manageable by looking it over periodically. Realistically I may have to rethink my system as my stockpile continues to grow, but for now it's working. Sure, occasionally I still run out of something - but it's usually because I am looking for a great deal, not because I didn't realize we ran out. The hubby, kids and I are pretty good about identifying when we've gotten down to only 1 left of something in the stockpile and putting it on the shopping list. The goal is to NEVER get down to only 1 left. We're getting there! This weekend we have a great friend visiting from out of town. Most of what I needed for the visit was just waiting down in my stockpile. This is one of the things I love most about my stockpile. Most of the time when I need something I can just walk downstairs (or better yet, send a kid) to get what I need. Talk about never running out of stuff - it's awesome to always have extra on hand! Several months ago there were some great deals on those little Post-It Signature Flags. I bought a few for work, but then started to imagine they could help me manage my stockpile. The kids spent a whole day checking expiration dates and flagging each perishable item in the stockpile. If you click on the picture to see a larger version, you'll see that the flags have the expiration month written on them. The color indicates the year. Yes, I know what you are thinking. I am insane. And that's OK. This method works for me. I had a conversation this weekend with a good friend who decided he wanted to try couponing. However, he does not plan to stockpile anything. He plans to just buy what he needs, for free, at the time he needs it. Now it’s pretty rude to laugh right in your friend’s face, so I didn’t, but I wished him good luck. He’ll need it, for sure. I’ve said many times in this blog that having multiple copies of coupons is key to succeeding. The concept of stockpiling goes hand in hand with that. When you have multiple copies of coupons and a great sale happens, you stock up! Why? Because if you only buy one, it is doubtful that a great sale/coupon matchup will be available exactly at the next time you need to buy the product again. You’ll end up paying too much, or, heaven forbid, full price. Please stockpile! When I find a good price, I buy at least 4 of each item my family uses regularly, which gives me enough leeway to be able to wait to buy it again until the next great deal. I have passed up items that I could get for 75% off because I know I have enough to hold me until I find them free again. Similarly to friends who insist on couponing with only one set of coupons per week, refusing to stockpile items is a recipe for couponing disaster. It’s these people who inevitably declare in frustration that couponing just doesn’t work. It does work if you following the basic principles. It won’t work if you don’t. Period. The general suggestion for how much to keep in your stockpile is to have enough of each item to last your family between 3 and 6 months. This is because sales and coupons are cyclical. You don't need to buy 300 containers of mustard because within 3 months or less it will be on sale and have a coupon again. Obviously what my family uses and what your family uses will be different in terms of products and quantity, so you have to figure this part our for yourself. For me, this translates to a quantity of between 4 - 8 of most of the items in my stockpile. The time to break this rule is on items that have a long shelf-life, when there is a really great price or the item is free. At that point you can stock up between 6-12 months worth. For example, I have a year's worth of items such as hair dye, shampoo, toothpaste, deodorant, razor blades, and laundry detergent. Most were free - how could I resist? These items will not last indefinitely so I didn't purchase more than we'd use in one year. There are other items that will last a long, long time, so I will buy as many of those items as I can if they are cheap or free: tissues, toilet paper, paper towels, q-tips, ziploc bags, and printer paper. My secondary stockpile, which lives in a closet in the finished area of my house, contains about 15% of my total couponed items. This stockpile contains 10 cases of bottled water, and any food that comes in boxes and bags. I have this fear of keeping boxed food in the unfinished area - I'm afraid bugs will get into the boxes! Accordingly, I keep cereal, Pop-Tarts, pancake mix, cake mixes, brownie mixes, chips, crackers, rice, pasta, coffee, cookies & candy there. In reality, my brain acknowledges the fact that bugs are capable of crossing into the finished areas of our home, but it makes me feel better anyway. Well, it depends partly on what you have available to you in terms of space. For example, I have lots of space in the unfinished area of my basement, so I am able to keep a ton of stuff down there. I have a separate chest freezer which can hold a lot, but I am worried that it will stop working so I'm fairly conservative about what I put in there. I do not have a second refrigerator, so my ability to stockpile refrigerated-only items is quite low. I'm not saying I never stockpile any refrigerated items - I've had 5 large containers of orange juice, 18 small ones, 12 packages of hot dogs, 10 tubs of spreadable butter, and 10 packages of various Pillsbury bread items in there. But that, along with all my regular food, is pretty much all I can fit. Take a look around your place and identify the potential space you have for your stockpile(s)! Yes, I did have someone look at my stockpile and ask me why I would buy some of it, which did make me cranky, but I cannot say it instilled a FEAR in me against showing it to anyone else. I've just decided to take the "show-my-stockpile-only-if-someone-asks" approach as opposed to the "COME-AND-SEE-MY-GREAT-STOCKPILE" approach. "So, what's in your stockpile?" This is one of the most common questions I get. I will start out by saying that stockpiling items is a key component to couponing. You need to have enough items in your stockpile to last you until the next time you can get that item for free or cheap. How many you need of each item depends greatly on how much of that item your family uses. Because of this fact, you could look at someone else's stockpile and think that person must be crazy because it doesn't fit what would work for your family. Let me just say - please do not judge other couponers! I have had my stockpile judged and I didn't appreciate it. So much so that I have not showed it to anyone since for fear of once again having to justify what items are in my stockpile and how many I have. So what's in my stockpile? More on that tomorrow. If you've watched Extreme Couponing you may think that all couponers are hoarders. Some are, for sure. Take the lady who bought 100 bottles of mustard and no one in her family likes mustard. People like that are just organized hoarders. They don't have a disgusting mess like traditional hoarders, but their homes are over-run with free stuff which makes them... wait for it.... Hoarders! There is a delicate balance between having enough stuff but not having too much stuff. That's why I like the one-newspaper-per-person-in-your-family guideline. That way you are not going to end up with 100 of something that will not get used before it expires. So what is a reasonable, non-hoarding amount of couponing? We'll delve into the stockpile concept next. Now that you know many intimate details of my buying practices, let me tell you how coupons fit in to the picture. If I have a coupon that will get me an item free or very cheap, I will buy one even if I haven't used it before to see if I like it. I have found that most name brands are pretty good. Some items that I am brand loyal to very rarely have coupons. At that point I need to rely on watching sales and store rewards to get the cheapest price. I will tell you a secret - not everything I buy has a coupon... SHHHHH!!!! Don't tell. Yes, I still have to buy certain items without a coupon, and I'm OK with that. Am I walking out of the store paying less than $1 and getting $500 worth of stuff? No. But I am still getting good deals. So the bottom line is, you can be brand-loyal and still coupon, but the more items you are flexible on the better. Sometimes coupons make the register beep despite having bought the correct item in the correct size. A beeping register is never a good sign. It means the coupon is not automatically being accepted. When this happens, some cashiers will simply just push the coupon through. I find this happens frequently with cashiers like the young man who works Sunday mornings at my local Walgreens. He helps me every week and I feel I have proven myself to him as a reliable couponer. I think he trusts me. Some cashiers will ask if you did indeed purchase the item, and then put the coupon through. Some will look through your purchases to confirm. Since I always follow the specifics of the coupon, I certainly don't mind. Some cashiers will immediately panic and call the manager (this happened to me just yesterday). Some will flatly refuse to honor the coupon if it beeps (this also happened to me yesterday). Some will even accuse you of coupon fraud or trying to steal from the store. Thankfully this hasn't happened to me. Part of the reason I carefully choose a cashier is to avoid the hassle and hold-up of having the manager come over. I also want to avoid having an angry mob form behind me as everyone has to wait (this ALSO happened to me yesterday). Ugh. So how do you pick a cashier? We'll cover that tomorrow. Despite the fact that I try to run to the stores on Sunday and get the great deals, sometime I do miss out. If this happens to you, don't worry - all hope is not lost. Here is a phrase every extreme couponer needs to learn: "Can I have a raincheck for that item?" Rainchecks are WONDERFUL! Most stores offer them on most sale items, but not all. If a sale item is out of stock you can get a raincheck that allows you to get the item for the sale price when it comes back in stock, after the sale has ended. This rocks because within a week of the sale ending, the shelves are usually fully restocked. The biggest risk is that your coupons may expire before the item comes back in stock. Even if this happens, all hope is still not lost! Coupons are fairly cyclical, so hang on to that raincheck and often a new coupon for that item may be released within a short time. TIP: Don't wait until the last day of the sale to get your raincheck. The very first time you go to a store and an item is sold out, get a raincheck. Don't believe them when they say they are getting another shipment on Tuesday. Often an item will never come back in stock during the week, or if it does, your extreme couponing comrads may grab it up before you can get there. Get the raincheck right away. If you go later in the week and the item is in stock you can buy it, but save that raincheck for a future awesome sale/coupon matchup. Sometimes you can even coordinate it with a store reward too! So on the heels of my post yesterday about newspapers, tonight I received a call from our old newspaper company asking why we cancelled our subscription. I explained about the deal I got from the new newspaper and how I had contacted the old one to see if they could do a similar deal but they said they could not. The lady then says, "well we have the same deal - $50 for the year." So I explained that the best deal they told me was $120, so I had instead gotten 4 subscriptions to the other paper. I guess I should have known better. I have found with most services that if you cancel and then wait, they usually call you back with a better offer. In this case I had already pre-paid for the new newspaper for the year so I'm not switching back. But I would have been happy to stay if they had matched the deal either time I inquired about it. One day I'll write about the smoking hot deal I got with XM/Sirius! If you were in the grocery store and saw a "Buy 1, Get 7 Free" sale on a product you use, you'd jump on it right? Me, too! Well today I made my own B1G7 sale using store sales and coupons together. 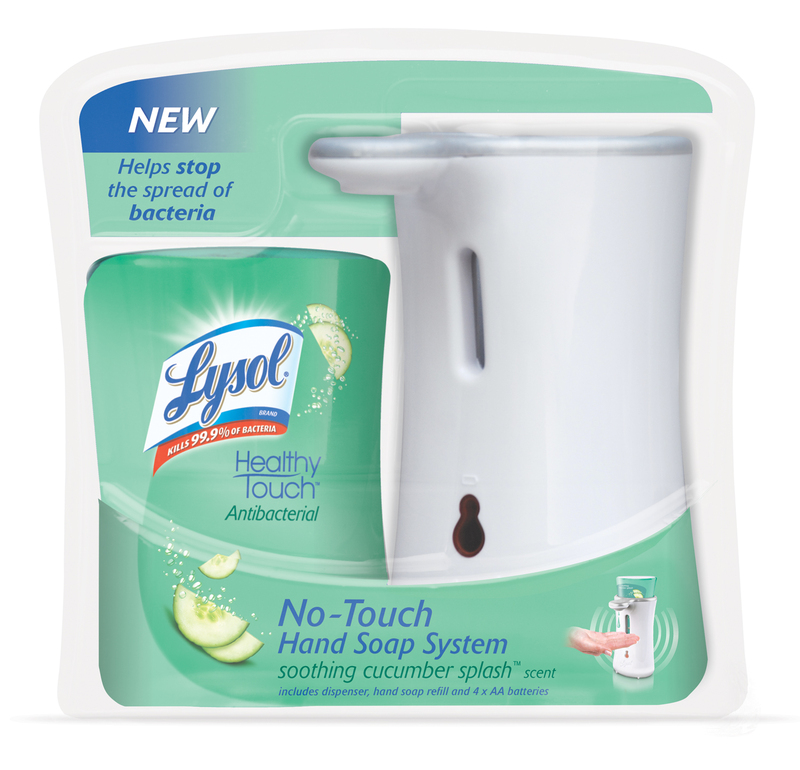 A few months ago I bought a couple of the very cool, Lysol Healthy Touch No-Touch Hand Soap Systems. I had seen them on sale for anywhere from $9.99-$14.99 but scored them for $3.99! I was pretty excited... until the soap ran out. I found out the refills cost $3.99 each - for only 8-oz! I was used to buying a large bottle of soap to refill my old soap dispensers, and was determined to do the same. I couldn't get the top off the Lysol container, but my husband was able to do so with a screwdriver. Hooray! Unfortunately I was out of refill soap so I went to buy some. The 40-oz store brand refill was $3.99. Sure, it was the same price, but it was 5 times the size of the individual Lysol refills. However I still didn't want to spend that much. I started to explore other options and looked at the individual 8-oz bottles of Dial soap. They retailed for $1.60, but were on sale for .88 cents. I had a .35 cent coupon that would double, enabling me to get each for only .18 cents. 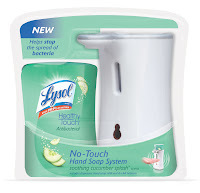 If I bought 5 of them (40-oz worth) and used them to refill my Lysol dispenser, it would only cost me .90 cents instead of $3.99 for the larger refill or $19.95 if I bought the correct Lysol ones. I used all my coupons and bought 8, which cost me $1.44 total. That is less than the $1.60 retail cost for one. So I look at it like I bought 1 and got 7 free! I wish I could have gotten as good a deal on the 40-oz refill so I wouldn't be wasting all the individual packaging, but an .18 cent refill was too good to pass up! A rude awakening that most new couponers get is that there are NO COUPONS on most holiday weekends! Given that tomorrow is Labor Day, there are no coupons in the paper this weekend. Many new couponers buy their 4 papers and get them home only to find no coupons. If you follow my advice, however, which is look in each paper before you buy it to check for coupons, this will never happen to you. But back in the day when I first started I didn't know about that rule and came home with a stack of papers on Memorial Day weekend and was very disappointed. If you are ever unsure, you can check SundayCouponPreview.com to see what coupon inserts are coming. Sometimes I will look to see which specific coupons are coming in each insert, but coupon amounts and details vary widely from region to region, so just understand that the specific coupon you get may be slightly different than the one listed. Regardless, while no coupon weekends stink for sure, it is nice to get a break once in a while. Take time today to clear out very old coupon inserts out of your whole insert filing system, or revamp your binder. And have a great long weekend! Today, once again, I popped into the grocery store. We were having some friends over this evening and I needed to pick up some paper goods. I didn't have a coupon (shocking, I know), so I was evaluating the cost of the store brand vs. the Solo brand of plastic plates. So I pull out the Solo plates to see how many are in the pack, and to my surprise there was a coupon on top of it! Some generous couponer had left 2 coupons there. This is not the first time this has happened, especially in this store which happens to be frequented by many couponers. I, too, have left coupons for people, but usually it's when the coupon is expiring soon and I know I won't use it. The coupon I found today didn't even expire until October and saved me $1 off! For the record, I used one coupon and left the other for the next lucky person. Sometimes couponers get a bad rap - that we are hoarders or buy things we don't use or need. This couponer's random act of coupon kindness proves that couponers are good people too! Thank you! In order to print coupons you need to install special "coupon printer" software on your computer. Before doing so you must set your default printer to an actual real-life printer in your home. The software will not allow you to print to any type of PDF printer. Trust me, I've tried. I know you may be tempted to try too. Go ahead. When it gives you a message saying it can't print, and provides all sorts of convoluted directions to fix it, at that point just change it back to a real printer and it should be fine. There are about 4 major sources for printable coupons on the internet. Each will require you to install their own specific coupon printer software. It is a bit of a pain, but the good news is that you only have to do it the first time you try to print coupons for each of the 4 sites. Where do you get the software? After you select your batch of coupons, each site will check to see if they are able to be printed. If it's your first time on that site it will automatically prompt you to download and install the software. It's quite easy. You can do it! I have faith in you. Most coupon sites allow you to print two copies of each coupon per computer, so if you have more than one computer then you are in luck! Being computer geeks, we have many computers in our house. In addition to our current computers, we also have two computers that we replaced because they were too old and too slow. (One is my old laptop where if you move it at all the entire screen turns bright pink). We set up both as dedicated "coupon computers" and fire them up for the great coupons! Don't think you can trick them by using multiple accounts on one computer. It doesn't work. We've tried. However, we have had some limited success using virtual machines on our apple computer. Workplace computers are generally not an option as you need to install "coupon printer" software in order to print the coupons. You can only do this if you have administrative rights to install software on the machine. Another option is to ask people to print coupons for you. Since obtaining multiple copies of coupons is key to successful couponing, find some way to get them! To print coupons you obviously need a computer and a printer. Please note: coupons do not need to be printed in color!! Even if you have a color printer, it would be advantageous for you to change your printer options to print your coupons only in black and white. Often, your coupon will print with a large advertisement under it. What a waste of ink! If you don't currently have a printer, I would suggest purchasing an inexpensive laser printer. I have a Brother laser printer that I got for $50 at one of the office supply stores. It prints great, and the toner seems to last and last. Also, the toner ink doesn't dry out like in inkjet printers. Also, consider the fact that some stores will offer a credit if you trade in an old printer. And it doesn't have to work, either! So if your current printer breaks, hang on to it in the closet - it could be worth a nice discount for you in the future. So far we have covered how to manage the Sunday coupons and organize your coupon binder. Things are starting to look good, with only one problem - you haven't done any couponing yet! That's OK. Don't panic. Being prepared is critical to extreme couponing. You need many copies of lots of different coupons to be successful. I tell people you should probably spend about a month gathering coupons before you have a large enough collection to be effective. Use this time to make sure you have everything organized and ready! What is the next step? Once you feel you have a handle on the Sunday coupons, the next step is to tackle printable coupons. 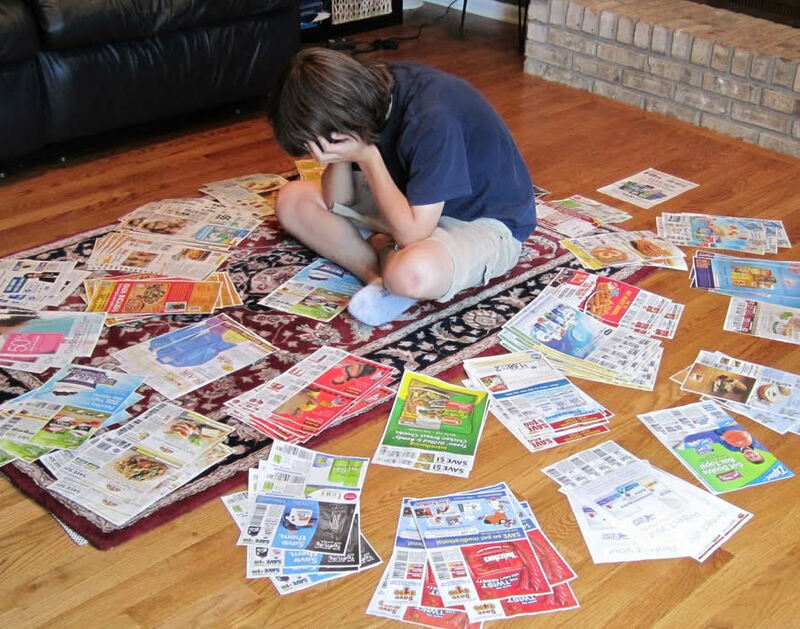 Printable coupons can definitely be confusing and cumbersome. We'll begin to learn about them tomorrow! I am a teacher and I started back to school yesterday. I had originally planned to coupon only in the summer and then stop once school started. I used my summer off to really ramp up my extreme couponing and amassed a huge stockpile in 3 months. Once I got all my systems in place I realized that I could keep it up once school started. So this is the real test! After dinner I worked on some things for school, then checked my favorite coupon sites for new printable coupons and newly found deals. I found a few goodies that I plan to pick up on my way home tomorrow. I really feel it is feasible to keep up couponing while working. I'll let you know how it goes! It's the extreme couponer's favorite day of the week - the day the new coupon inserts come out! Hooray! As a reminder, the rule is to get one set of inserts per family member. For me, that means I'm going to buy 4 newspapers today. Remember, as an extreme couponer you MUST have multiple copies of the coupons in order to get the most deals! Once you get or buy your coupons, make sure that you collate them and clip the coupons TODAY! Don't wait. If you wait, coupons have a way of piling up on you. Several weeks of unclipped coupons are a nightmare to go through. Also, you might miss out on some good deals if you don't have all the coupons with you! Make sure you clip all the coupons you think your family will use, as well as anything you would be willing to try if it were extremely cheap or free. Once they are clipped, file them directly into your binder. This should go much more quickly than last week! Last reminder: Do not throw away the rest of the coupons. Store them in a folder with today's date in case you need to find a coupon in there at a later date. Let me guess, you are freaking out, right? Today is Saturday, which means more coupons are coming out tomorrow, and you barely have gotten last week's coupons under control. You are not ready for new coupons!!!! Rest assured that this couponing thing get easier! We've been working together all week to get your binder set, and now it is! Next week you won't have to do all that! It will be much easier to just add in the new coupons. Tomorrow is one of those weeks were there is only one set of coupons coming in the paper (Smart Source). There are a handful of weeks that only have one insert, and some holiday weekends that have none. Normally this is not a happy occasion for the extreme couponer, but in this case we will glady accept an easy week! So now that you have all the items you need for your coupon binder, you can start to add the coupons to your binder. Spread the trading card pages and alphabet or category dividers throughout the binder. Put each coupon in its own section on the trading card page. If you have more than one copy of a coupon, which you should, put all the copies in the same section. These pages should contain all of your manufacturer's coupons. You should also start to collect store coupons. I don't recommend filing these in with the manufacturer ones. I use heavy plastic pocket dividers to not only separate off each store's coupons, but also to hold various coupons books and lists of the items I wish to purchase at that specific store. A Zippered Binder. You can use a regular binder, but the potential for coupons slipping out is significant. Also, the zippered ones usually have several large pockets, inside and out, which come in handy. (This is the one I use - it retails on the Mead website for a staggering $23.79 but Walmart has it for $10. Also, you can get it for $8.50 if you use the $1.50 coupon available from Target. Yes, Walmart will accept Target coupons! - more on that later). Trading Card Pages. Primarily used for baseball cards, these plastic protectors have nine sections for coupons on each page. You may eventually need many of these, but perhaps buy enough to have 1 or 2 pages per alphabet letter or category (depending on your type of organization). Divider Tabs. These are a good choice if you are organizing by alphabet. You can use a standard divider if you are organizing by category. Pocket Dividers. Strong plastic dividers with pockets are great for coupon booklets and assorted goodies. Scissors and Calculator. While you have these at home, it's a good idea to keep a small pair of scissors and a small calculator in your binder for some on-the-go couponing. Please note I have linked the above for reference only. In no way are these the best prices you can get on these items. Shop around and never pay full price! Do you want to bring your coupons around with you? If so, a zippered binder, small accordion organizer or series of envelopes might be the best option. For many years I used a small accordion coupon organizer but I often was unable to find the coupons I needed when I was in the store. To add to the problem, I didn't really know which coupons I had, and didn't prepare ahead of time for my shopping trip, but that is a topic for another day. I have recently changed to a zippered binder that my son had left over from school that was still in decent shape. It's wonderful and works perfectly for my needs. At this point you should have multiple copies of quite a few coupons from this Sunday's paper. What should you do with them now? 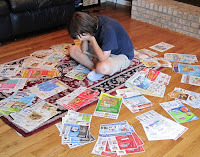 You need to give some thought to how you'd like to organize your coupons. 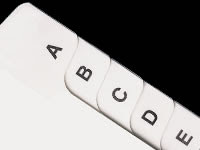 The two most popular options are (1) Alphabetically or (2) By Category. That being said, you can choose any other method that works for you. For many years I used a quasi-category concept - I used categories like "frozen & refrigerated", "stuff that comes in boxes/bags", "stuff that comes in cans/jars", "fresh things", "personal care", etc. Some people do much more specific categories. For example, instead of "personal care" they may have individual categories for "oral care", "hair care", "shaving", "soap", etc. That level of organization was too cumbersome for me. Likewise, others would have trouble understanding my filing system, but the only person who needed to understand it was me, and I thought it made perfect sense! That concept worked pretty well when I was doing light couponing, but the amount of coupons in each category became too excessive when the volume of coupons increased. I have recently switched over to organizing them alphabetically which is working out very well for me! If you think you'd like to organize by category, start making a list of what categories make sense for you. You can always change/adapt your system later, but the more you have in place at the beginning, the less work it will be in the future. Remember, you organization system needs to make sense to YOU! Today is the first day of your life as a serious couponer! The first step is to start collecting multiple sets of coupons. It's Sunday! It's Coupon Day! There are two inserts coming in the newspaper today: Smart Source & Red Plum! Unless you have friends/family/co-workers that you can beg coupons from, you need to go out and buy one newspaper per member of your family RIGHT NOW! Don't wait! And take my advice - look through each newspaper before you buy it to make sure the coupons are in there. Some less than scrupulous couponers have been known to steal coupons from the newspapers at stores. There's nothing worse than getting your newspapers home and finding no coupons in them. OK, maybe there are worse things, but still, missing coupons is pretty bad. I've said it before but I will say it again: There's no way around it, you MUST have multiple sets of coupons to be successful. So you've decided to give couponing a try. Congratulations! Get ready to save money and build an impressive stockpile! Whether you aspire to be an extreme couponer, or just a moderate one, the first step is to start collecting your coupons - as many as you can get your hands on - every week without fail. Multiple copies, every week. This is critical. Some people think they can take one copy of this week's coupons and save a ton of money. That is just not how it works. It may take about one month's time after you seriously start collecting coupons until you start to see big savings. Don't give up! Be patient and keep collecting!. It will pay off for sure! Not only do you need plenty of coupons, but you also need a way to organize them that allows you to locate the coupons you need quickly and easily. I used to use the traditional small accordion-style coupon file which I kept organized by category. I would find myself in the grocery store, digging through it over and over attempting to find a coupon I thought was in there. Often I couldn't find it. Sometimes I found it at a later date which made me crazy! I knew I needed a better system, and have since adopted the "zippered binder / baseball trading card pages" concept that is so popular with extreme couponers. Mine is organized alphabetically and has been a true miracle in my efforts to coupon. I now can find any coupon in just a few seconds and never lose out on the good deals.